There is nothing that the ladies of Prezza including the mayor Marianna Scoccia cannot tell you about their famous artichokes; their particular favourites are stuffed ever so simply with breadcrumbs, without cheese or anything to detour your taste buds from the town’s compact sweet artichokes or their velvety crema that is superb on bruschetta or slipped into lasagne or ravioli for a healthy meat-free pasta feast. 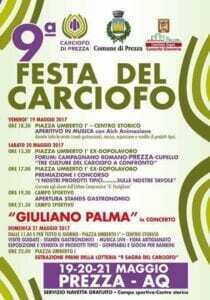 Prezza’s Artichoke & Olive Oil Sagra is held the 3rd weekend of May (each evening after 18.30, 19-20-21 May) and celebrates the artichokes that grow on just one side of this small fortified town that sits on a spur of the Sirente. In times gone by artichokes were the staple that many families depended on to survive. 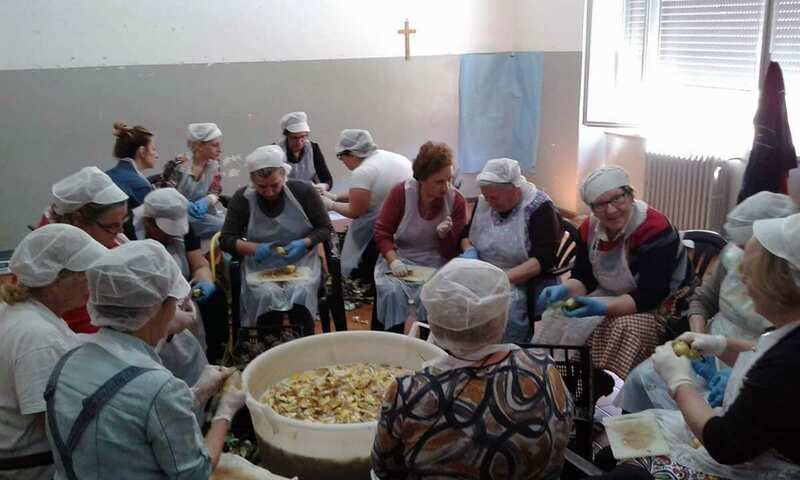 This affected some of the older members of the community as children, yet all the ladies still have an enthusiasm to don the gloves that counter the black hands that artichokes can produce and positively revel in prep for the artichoke sagra. Tenacious and hardy, Prezza’s artichoke is able to endure the chill and snows that winter brings to the town and in the summer the evenings’ welcome fresh breezes which gust down from the crown of the mountain. Unlike their better known big fat globe cousins or even Abruzzo’s other famous artichoke the Cupello, these are small, their width being under 5 cm (2″) with lighter coloured leaves that are tender and without a hint of bitterness. The artichokes are popular right across the Peligna Valley where Prezza nestles between Corfinio where the name ‘Italia’ was first established and Sulmona so if you miss the sagra you’ll still be able to find the artichokes stocked in many of the local food shops and restaurants. It’s really worth a visit for its vistas, people and rather amazing butcher shop. Italian Cooking Holiday offers 3 or 7-day food, wine and cooking holidays in the town with Chef Ezio Gentile who utilises the lovely local ladies on a couple of days to teach guests 1 0r 2 of the recipes that have been handed down across the generations. Abruzzo’s Michelin chef Niko Romito recommends serving artichokes with rosemary and burrata or guanciale – see what you can create! Add you bread, salt and pepper, garlic and parsley into a food blender and pulse until a fine breadcrumb mixture. Clean the artichokes, remove the hard leaves, remove the choke and trim. Cut the stems off so that they are able to stand up and place close together in a roasting pan so that during cooking so that the filling won't fall out. Open the artichokes up with your index finger and fill with the breadcrumb mixture. Drizzle 50 ml of olive oil over the top of the artichokes. Cook slowly for 40 minutes. Use a fork to check their softness and plate. It’s a great town, I so enjoyed my stay there last year!